The pop-up shop is being advertised by the chocolatiers with a “Mum’s Birthday” ad, featuring a young girl who buys the sweet treat for her mom with a few buttons and a plastic ring. It’s also being promoted by YouTube influencers. 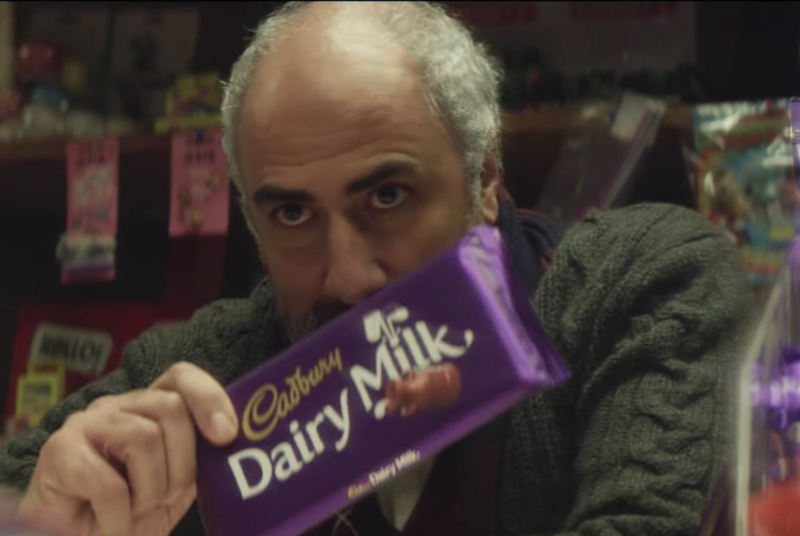 The point is for people to get excited about kind actions, and hopefully bring some of that into their daily lives after experiencing Cadbury’s generosity. The promotion also offers an opportunity for everyone clear their pockets of junk. 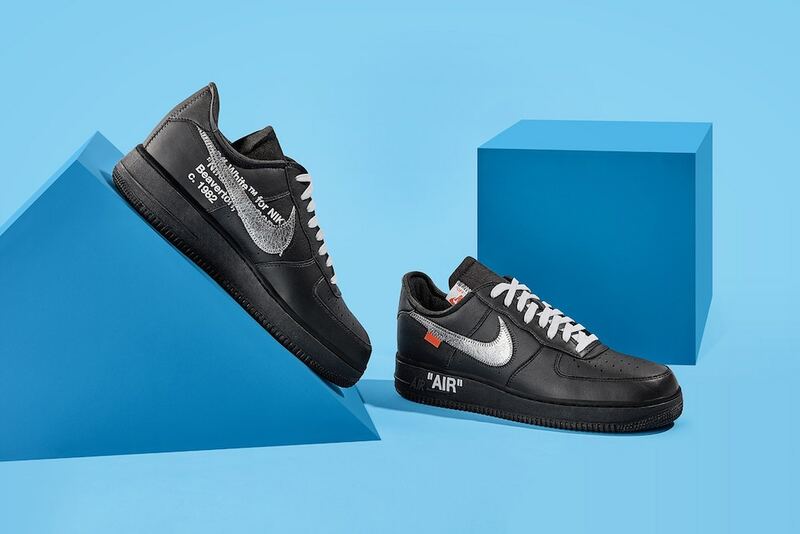 Nike‘s new sneakers, the Virgil x MoMA x Nike Air Force 1s, were revealed at the Museum of Modern Art to mark the end of its “Items: Is Fashion Modern?” exhibit on January 27. The exhibit, which started in October last year, explored the past and present (and sometimes the future) of fashion through 111 items of clothing that have made an impact in the 20th and 21st centuries. Items included Levi’s jeans and “the little black dress.” The unveiling caused a stir on social media, with Nike fans posting about their purchased sneakers. The lucky ones were able to buy them at the MoMA Design Store for $175, although by now they are going for around $1,000 on resale. The shoes, designed by Nike and OFF-WHITE Virgil Abloh, display an all-black colorway, “AIR” branding on the midsole and a metallic Swoosh. In late 2014, the hashtag #WhyIStayed was trending on Twitter. 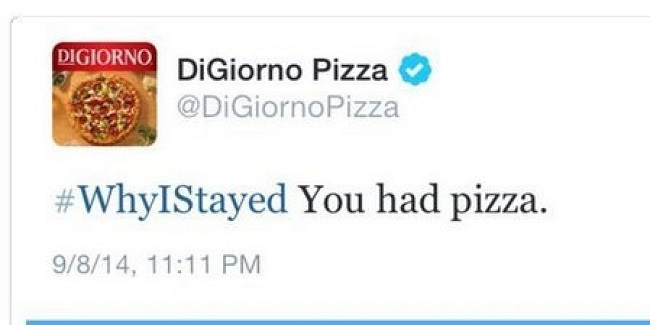 Frozen pizza slinger DiGiorno, known for being snarky and clever on social media, wanted to join the fun: There was just one problem: #WhyIStayed started in response to a video of domestic abuse. Women used the hashtag to tell their own story of abuse and talk about the societal pressures that led them to stay with their abusers. At best, DiGiorno looked clueless. At worst, it looked like they were making light of a very serious issue. All they wanted was a little brand visibility...and they got it, but not in the way they were hoping. 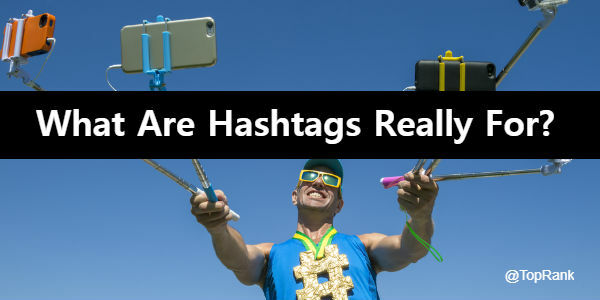 Hashtags are an integral part of Twitter and Instagram (and Facebook, to a much lesser extent). As such, they should be part of our social media marketing on each platform. But as DiGiorno and many other brands have shown, it’s not enough to look at the trending tags and hop on board. Marketers need to understand what hashtags are for and how our audience is using them before we jump in. Here are the #fundamentals you need to avoid invisibility or embarrassment with hashtags. Hashtags started as a feature on IRC (Internet Relay Chat) channels back in 1988, when the internet still ran on steam turbine power. The "#" in front of channel meant that it was available for users across the internet, not just on a local area network. Twenty years later, IRC fans who were early Twitter adopters proposed using the symbol to help classify common topics or groups. Twitter itself didn’t officially recognize hashtags for two more years. In 2009, the site started automatically hyperlinking hashtags to search results. Facebook added hashtags in 2013, but they don’t see as much use on the platform. By contrast, Facebook-owned Instagram practically runs on hashtags. It’s not unusual to see a post with a four-word captioned followed by a paragraph of tags: #NoFilter #WokeUpLikeThis #BeachLife #SanDiego #ChihuahuaLove. Clicking any of the tags leads to a custom feed of images with the same tag, much like Twitter’s search functionality works. How else could your hashtag be interpreted? What other conversations might it start? Hashtags started as a tagging tool for search. Today, they’re used to create a space for conversations, group people with similar interests, and fill Instagram feeds with puppies. To be most successful with your hashtags, respect conversations that exist already, and be cautious about the conversations you start. Need to #LevelUp your social media marketing? TopRank Marketing can help. The post What Are Hashtags Really For? #Confused #Blessed #NoFilter appeared first on Online Marketing Blog - TopRank®. IKEA imagines a future where people not only rent their apartments, but their furniture as well. 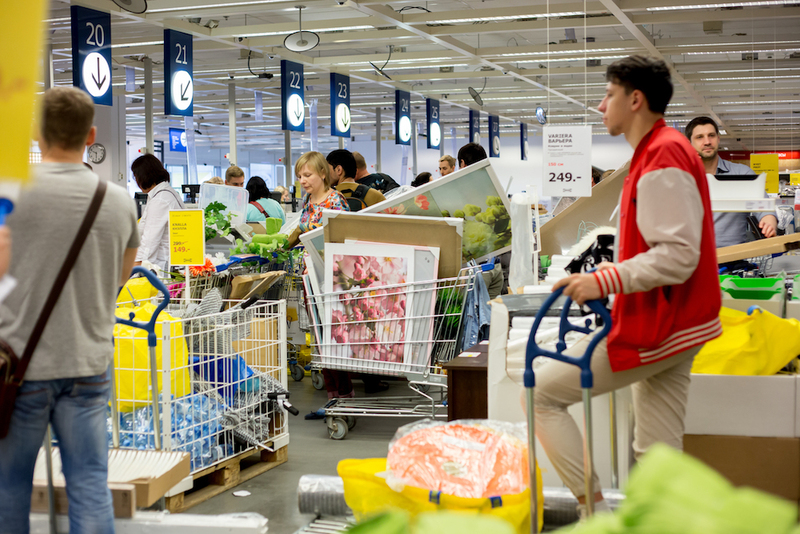 As part of a sustainability initiative, the Swedish home retailer says it is experimenting with furniture rental plans for different regions. The model would reduce the amount of furniture that gets thrown out and allow materials to be recycled. IKEA did not announce when or where these trials are taking place. Samsung released a smartwatch app to warn sleepy drivers before they doze off, but the novelty is how they’re marketing it. 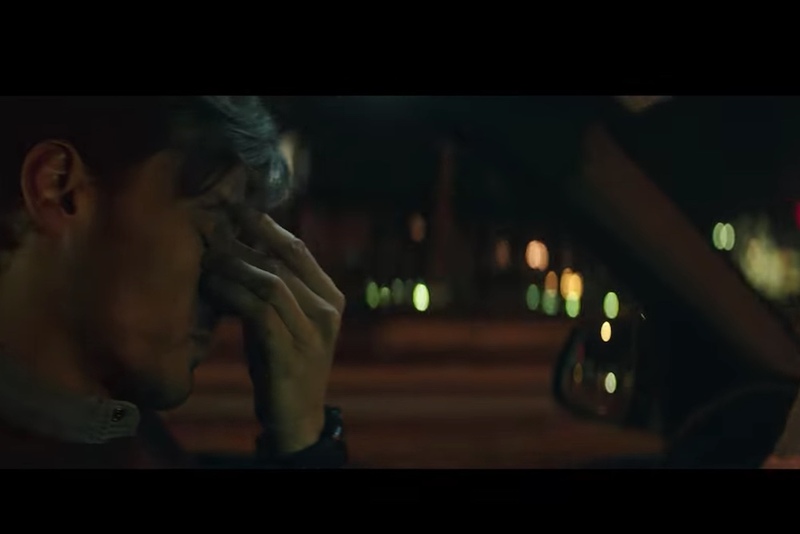 In a one-minute video by Cheil Spain, the tech company flips “can do” advertising on its head by letting the viewer know that not even the strongest or fastest can beat sleep. The video sets up the scene with a series of admirable characters—a cyclist with only an arm and a leg, a basketball player making an impressive slam dunk, people training various in fitness disciplines—along with positive messages, “Determination overcomes any storm. The body obeys unbreakable will.” But then it makes a dramatic change in tone, as the narrator warns darkly, “There is something they can’t do. Not the strongest. Not the fastest. Don’t try to beat me!” Which, of course, means sleep. The app, called Copiloto, monitors acceleration, time spent on the road and heart rate, among other things, to detect if the driver is about to fall asleep. If that is the case, it sends rapid and frequent vibrations as a warning. According to the findings of a new three month study, tailored and interactive text messaging are powerful tools when it comes to boosting chronic condition medication refill adherence in Medicare patients. On Tuesday, mPulse Mobile — a Los Angeles-based mobile health engagement solutions company — announced the results of this first of its kind study conducted with Kaiser Permanente. Per the data shared, the peer-reviewed study, recently published in JMIR mHealth and uHealth, found a 14 percent higher refill rate for those that received the text message intervention program. Patient nonadherence affects 50% to 60% of chronically ill patients, and the cost of medication-related hospitalizations is $100 billion annually. Non-adherence is a major concern in the management of chronic conditions such as hypertension, cardiovascular disease and diabetes where patients may discontinue or interrupt their medication for a variety of reasons. While text message reminders have been used to improve adherence, no other programs or studies have explored the benefits of tailored and interactive text messages with older populations and at scale. The full study, “Improving Refill Adherence in Medicare Patients with Tailored and Interactive Mobile Text Messaging: Pilot Study” can be found at JMIR mHealth and uHealth. Due to the success of the pilot study, the mPulse Mobile Medication Adherence program is being expanded to other Kaiser Permanente regions. The post Tailored and Interactive Text Messaging Improves Chronic Condition Medication Refill Adherence in Medicare Patients, New Study Shows appeared first on Mobile Marketing Watch. Will More Mobile Giants Step Up For Renewable Energy Commitment? This week, Green America congratulated T-Mobile on being the first telecom company in the U.S. to adopt the RE100 pledge, the company’s commitment to move to 100 percent renewable energy by 2021. T-Mobile is the first of the big four telecom companies in the United States to make such a pledge. Green America’s “Hang Up on Fossil Fuels” campaign, which started in 2017, focuses attention on the enormous amount energy used by the telecom sector and the fact that the biggest companies get the vast majority of their energy from fossil fuels. The telecom sector in the U.S. uses as much energy as 3 million households. T-Mobile CEO John Legere released a video directing people to support Green America’s campaign and challenging AT&T and Verizon to match its commitment to 100 percent renewable energy. Check it out here. Green America is calling on AT&T and Verizon, the two largest telecom companies in the U.S., to increase their renewable energy use to 100% by 2025, and will be issuing a report on the industry titled “Clean Energy is Calling” in February that will track the progress of the four largest companies in the sector – AT&T, Verizon, Sprint, and T-Mobile – in adopting clean energy and energy efficiency measures, and reducing their greenhouse gasses overall. The post Will More Mobile Giants Step Up For Renewable Energy Commitment? appeared first on Mobile Marketing Watch. MMW learned today that the 2018 Design and Verification Conference and Exhibition U.S. (DVCon U.S.) will offer attendees an intense, information-packed conference with 39 papers, 8 tutorials, 33 posters, 4 short workshops and 2 panels to choose from over the course of the four-day program. Sponsored by Accellera Systems Initiative, DVCon U.S. will be held February 26-March 1, 2018 at the DoubleTree Hotel in San Jose, California. “I am very proud of the program we have put together for our attendees at DVCon this year,” stated Tom Fitzpatrick, DVCon U.S. 2018 Technical Program Chair. “It is the must-attend conference for design and verification engineers because it continues to grow and evolve with the needs of industry. This year we’ve added some new vertical topic areas that I think attendees will find particularly intriguing and useful. Safety critical verification is a theme that attendees will see addressed throughout the conference, and the tutorials on Thursday afternoon are focused primarily on issues surrounding automotive safety and compliance. There is also a paper that will discuss UVM-based Verification of a RISC-V Processor Core. There is something for everyone at DVCon and our team of reviewers has done an excellent job of pulling the best for the program from an outstanding group of proposals,” Fitzpatrick concluded. To get a more complete guide to the conference, Dennis Brophy, DVCon U.S. 2018 general chair, explains why DVCon is even “Bigger and Better” in his Welcome Message to attendees. You can check it out here. For the full DVCon U.S. 2018 schedule, including a list of sessions, tutorials, workshops, sponsored luncheons and events, visit www.dvcon.org. To register for DVCon, visit here. The post DVCon U.S. 2018 Adds New Topics to Technical Program appeared first on Mobile Marketing Watch. A powerhouse partnership is the best way to describe the news shared yesterday by three of the most prestigious companies in the world. Amazon, Berkshire Hathaway and JPMorgan Chase & Co. announced Tuesday that they are partnering on ways to address healthcare for their U.S. employees, with the aim of improving employee satisfaction and reducing costs. The three companies, which bring their scale and complementary expertise to this long-term effort, will pursue this objective through an independent company that is free from profit-making incentives and constraints. The initial focus of the new company will be on technology solutions that will provide U.S. employees and their families with simplified, high-quality and transparent healthcare at a reasonable cost. Tackling the enormous challenges of healthcare and harnessing its full benefits are among the greatest issues facing society today. By bringing together three of the world’s leading organizations into this new and innovative construct, the group hopes to draw on its combined capabilities and resources to take a fresh approach to these critical matters. The effort announced today is in its early planning stages, with the initial formation of the company jointly spearheaded by Todd Combs, an investment officer of Berkshire Hathaway; Marvelle Sullivan Berchtold, a Managing Director of JPMorgan Chase; and Beth Galetti, a Senior Vice President at Amazon. The longer-term management team, headquarters location and key operational details will be communicated in due course, today’s announcement concludes. The post Amazon, Berkshire Hathaway and JPMorgan Chase & Co. to Team on U.S. Employee Healthcare appeared first on Mobile Marketing Watch.